Food here tastes very, very good! Alas, its too far from my place so I don't really get to eat at Muy Hong often. It is located in Banawe, Quezon City. 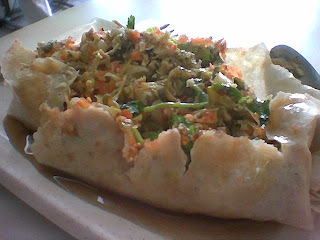 My favorite food here is the Chamisua and I think I can eat this every day. Chamisua is like pansit but with egg strips and peanuts. Muy Hong's chamisua is so good that you'll dream of when you'll be able to eat it again. Fresh Amoy Lumpia. I hope I got the name right especially the 'amoy' part- hahaha. Anyways, this is yum yum also. Lots of wansoy and peanut bits and sugar.